Registration is open for FSCPC’s Grassroots to Champions seminar www.grassrootstoChampions.com at www.figureskatingclubofparkcity.org. Limited spots are available. A limited quantity of private or semi-private lessons and group classes are also available on Wednesday, March 21st through Friday, March 23rd. Applicable admission fees to Park City Ice Arena or the Figure Skating Club of Park City will apply. 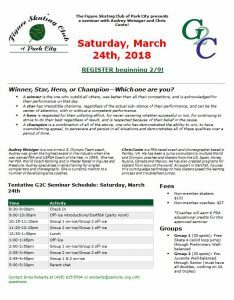 This seminar is also an endorsed Professional Skaters Association (PSA) event and registered coaches will earn 6 PSA educational credits for their participation. Contact Erika Roberts with questions at eroberts@parkcity.org or (435) 615-5704. This entry was posted in Announcements on February 9, 2018 by Erika Roberts. Some People Reach for the Stars, Nathan Chen Jumps for them! Future Champions, and National Competitors! Enjoy the Oval Ice and Fun Zone! Learn More about Learn to Skate Lessons across the Wasatch Front and Celebrate with us as we watch Nathan GO FOR THE GOLD! This entry was posted in Announcements on February 4, 2018 by Erika Roberts.